I've loved Bazzill cardstock for years, and recently the company has started releasing patterned paper and other products. The collection I used by Bazzill was called Beach House. The collection pack, which contains 2 of each patterned paper, plus coordinating cardstock; the 6x6 patterned paper pad, word stickers, and tag stickers. 3. The cardstock that came with the collection pack--LOVED that! I find that too often collection packs have so much of the patterned paper that I never use it up before I'm tired of it; what a brilliant idea to color coordinate the patterns with cardstock! 4. The texture on the patterned paper. I'm normally a smooth texture gal, but I liked the subtle texture (orange peel?) on the patterned paper. Made it interesting. 1. Too little yellow in the stickers and patterned paper. There was some--one piece of paper had specks of yellow on shells and a tag, one sticker was yellow--but since the collection was primary and neutral colored (red, blue, white, brown), I thought more yellow would be good. I'll confess, this might be totally my thing. I love yellow! Favorite color. And you can see from my first layout that I managed with the little bits that there were. 2. I would have liked more blank label stickers so I could write info on them. Again, that's something I like to do, so this may not be so much of a problem for people. 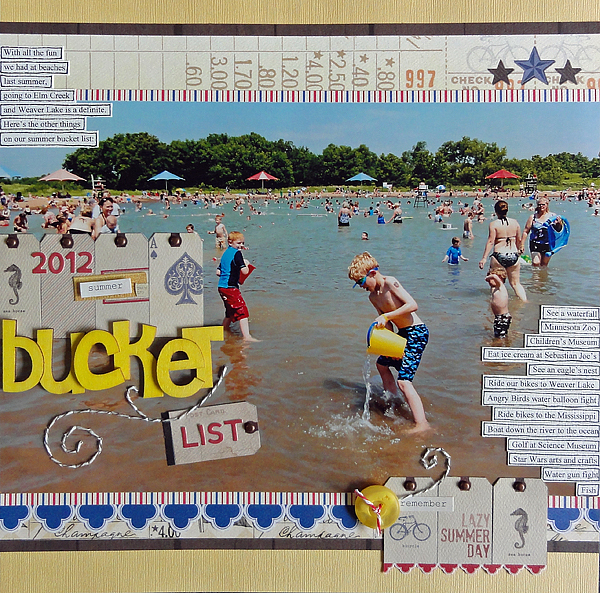 Supplies: Cardstock, patterned paper, stickers, stitching template: Bazzill Beach House; Baker's twine, brads: Stampin' Up! ; Letter stickers: Jillibean Soup; Wood letters: Pink Paislee; Mist: Studio Calico;Pen: Zig. I picked mostly neutral bits with pops of blue and red to pull out the colors from the photo. I also used the patterned paper to fussy cut tags to use on the page. The patterns worked well for that! Supplies: Cardstock, patterned paper, stickers: Bazzill Beach House; Baker's twine, brads: Stampin' Up! ; Letter stickers: Basic Grey; Date stamp: American Crafts/Studio Calico; Button: October Afternoon. Beach House worked well--lots of neutral patterns and colors that worked well for a snow page. Again, I picked some small bits of color to highlight the color in the photos. 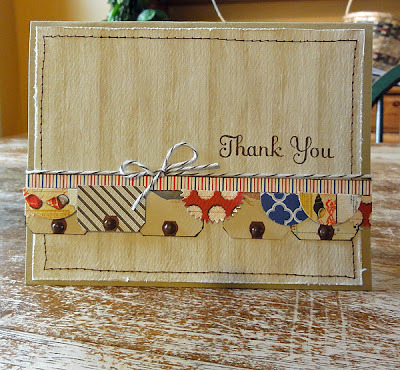 Supplies: Cardstock, patterned paper: Bazzill Beach House; Stamp, ink, baker's twine, brads: Stampin' Up! The collection worked well for a somewhat masculine thank you card. Overall, I thought that Bazzill Beach House was a winner of a collection, and I strongly recommend it, for you should be able to use it long after summer is gone (which here in Minnesota should be in September, unfortunately!). What do you think? Does this make you want to take a vacation just to use this collection? Or would you rather just stay home? Leave a comment by midnight EST on Friday to be entered to win a prize pack from Bazzill Basics! U.S. residents only and please leave a way to contact you if you win! This is a beautiful collection! I can see how practical it would be given the basic color pattern. And I understand how you were expecting more yellow given the color bar at the bottom. I also live in the Midwest, and while I like tropical theme product I never buy it, primarily because I know I would never use it all! I really like how you put this collection to the test with a snow day layout! This definitely proves the collection as practical for more than just beach/pool layouts. Thanks for reviewing! I love what you did with this collection. Makes me feel like going on vacation. Love how you have shown that this beach house collection works for snow too! Great projects and while I can see what you mean about the yellow, it's not my go to color, so I don't mind at all. I really like this collection.Bazzill has been doing some great work lately.The woodgrain piece is my favorite of all the wood grains I've seen lately. The colors are great. Really loving this collection. Thanks for the chance. I love this collection, I agree with you, this is so versatile to use with all photos. Hi, This is Vicki again, I forgot to leave my email address: vicki.bailon@gmail.com. Sorry for the second post. the Snow Day layout is amazing! Love how you used a beach themed collection to work with a winter project. The little card is really cute and of course the Bucket list layout is fun. What an awesome job show casing this paper. I love all of it. As a midwest girl, I am so with you on not buying the tropical stuff. How refreshing to have a collection that also could be used with boys!!!! 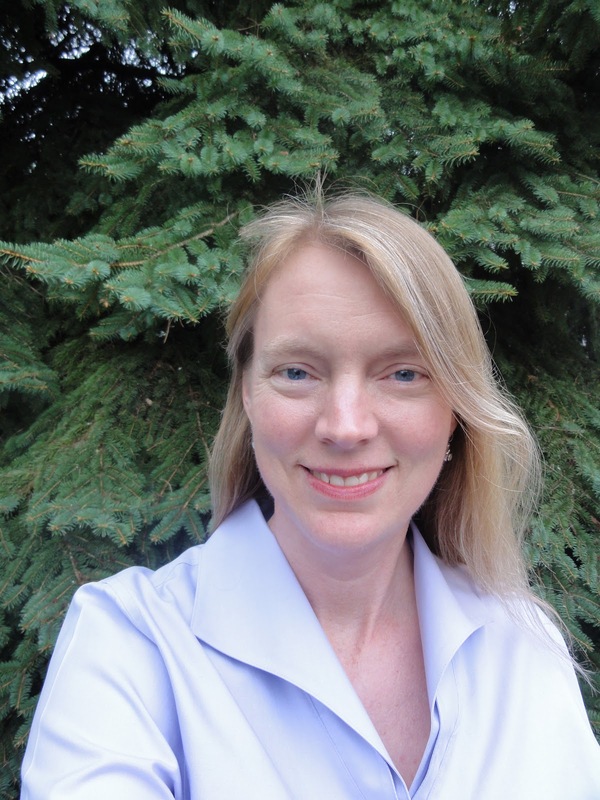 I just recently found your blog and I am so glad I did! I love this collection. Love the less cutesy looking paper. I love this collection. I much prefer a neutral collection vs. a real themey one anyway. I love how you used it for both seasons (I am a MN/WI girl), as I wouldn't be using it for tropical pics either. Your pages and card are fabulous. I really like the themed yet generic feel to this!!! I agree, this looks like a great, versatile collection. This collection looks gorgeous! I too would love to see a bit more yellow in it as well, but that is easy enough to add! I am also glad that it is not too tropical since I am much more likely to get to the lake this year than the ocean! Your layouts definitely have me wanting to take a vacation, but I adore how you've altered the look of the paper to winter without giving up design and awesomeness. Great job, love it all! I love how you used it for beach and then snow. Beautiful LO's and card. THis looks like a wonderful collection and one I would definitely use!! I love their papers! oh, I LOVE this collection!! I too, am tired of tropical beach themes and I really like that this one is more neutral. I like collections that can be used for a variety of themes and this one is perfect! I'm no much of a themed paper person either and LOVE how versatile this is!! I love the looks of this line! So many possibilities. Thanks for the chance to own it! Jennifer - Your layouts never disappoint! I love the way you used the product and now I'm inspired. Thank you! Oh you make me want to scraplift like crazy. That is a cool paper collection - I'm crossing my fingers now. LOVE this collection...absolutely love it! The colors and patterns are so great for so many themes and I like that they are subtle...which makes them more versatile. Thanks for the chance to win some great Bazzill Basics! Love your samples. I think that this is a must have collection. 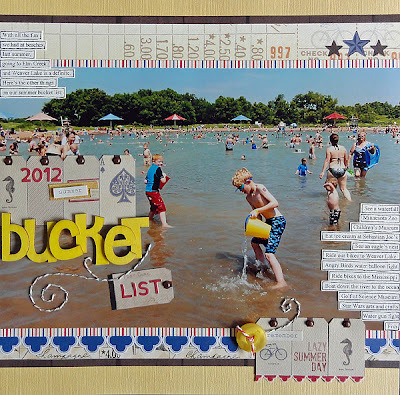 Love this collection and love, love, love your bucket list layout. Thanks for the chance! Only you could pull of a beach collection and use it for winter theme LO!!! I have been waiting for this to show up at my LSS....We are headed to Florida this summer and this would be prefect! I'm ready to go to the beach! I love the primary colors of this line. I know Bazzill is known for its card stock, but I'm excited to see them coming out with some cool patterned paper collections too. Great pages and card, Jennifer. Thanks for he chance to win! I think this is a pretty collection, I love the colors. What a wonderful collection, by one of my favorite manufacturers! I love the colors and patterns because they don't have to be used just for beach layouts. I like designs that are fairly versatile and these are definitely that! Love this!! I really like this collection and agree non-tropical beach themes are the way to go. Hooray BG for no tropical papers...my family loves the mountains and we eagerly seek cooler climates for summer versus hot sandy beaches.